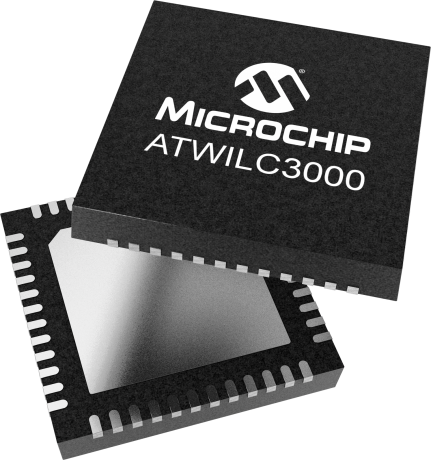 ATWILC3000 is a single chip IEEE 802.11 b/g/n RF/Baseband/MAC link controller and Bluetooth 5. The ATWILC1000 connects to Microchip AVR/SMART MCUs, SMART MPUs, and other processors with minimal resource requirements with simple SPI/SDIO-to-Wi-Fi and UART-to-Bluetooth interfaces. The ATWILC3000 supports single stream 1x1 802.11n mode providing tested throughput of up to 46 Mbps UDP & 28 Mbps TCP/IP. The ATWILC3000 features fully integrated Power Amplifier, LNA, Switch and Power Management. Implemented in low-power CMOS technology, the ATWILC3000 offers very low power consumption while simultaneously providing high performance and minimal bill of materials. The ATWILC3000 utilizes highly optimized 802.11-Bluetooth coexistence protocols. The only external clock sources needed for the ATWILC3000 is a high-speed crystal or oscillator and a 32.768 kHz clock for sleep operation. The ATWILC3000 can be used in Linux, RTOS or Baremetal Environments.